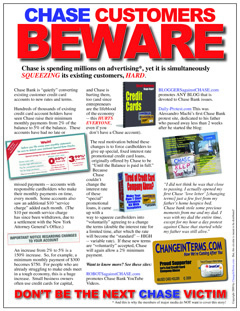 An issue that arose when Chase Card Services decided that it did not want to honor a promotional offer as was indicated by a change in terms notice that it disseminated to customers late last year (i.e., beginning around November-December of 2008). 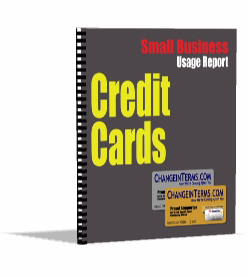 This report allows readers to gain a better understanding of the nature and scope of credit card usage by small businesses. We especially highlight entrepreneurial bootstrappers (who often use credit cards as a non-traditional source of capital). Dr. Lahm said the present publication was developed primarily for three audiences: individuals who either have or may soon experience “Chase statement shock” when they discover a substantial increase in their monthly minimum payments (which is two-and-a-half-times larger than their previous payment); members of the general public who are typically only getting a one-sided view of this issue (“because journalists are not digging deep enough”); and, for would-be or current small business owners. He added that while the document is copyrighted, other writers and bloggers my find the report useful (and it may be freely shared). If an entrepreneur has a $20,000 “fixed APR Until the balance is paid in full” loan with Chase, which could be associated with the start-up costs for quite a variety of small businesses, what may have been a very manageable $400 per month payment skyrockets to $1000 per month with the newly imposed 5% of the balance per month calculation, “a crushing blow for a fledgling business at a time when we need to do everything we can possibly do as a society at large to nurture entrepreneurs, not annihilate them.” The $600 increase could also cause the loss of a part-time employee or have a number of other ripple effects. This example does not necessarily imply that the $20,000 charged to a personal credit card account was used for business purposes; it could be the case that the loan was used for living expenses, while the business was getting started and just beginning to realize cash flow. Posted in: "Bail Out", Class Action, Credit Cards Coverage in the Media, Entrepreneurship, Join the Fight, Testimony. ← Chase “aimed at” account holders who were only paying the minimum? Someone must need new eyeglasses. I have two CHASE CREDIT cards without balances and not having one for approx. one year. I have other credit cards and all have “0” balance and I know I’m fortunate being the current economy. I work for the largest retailer in the world. Today, I went to one of our stores to purchase a HDTV totaling less that $900. I presented one Chase Card and declined and presented the second and declined. Obviously being I’m in a place where I am known I found myself in a very embarrassing situtation. I was never notified of these two accounts being cancelled at any time. One week prior to my attempting to use these cards today (8/19/09) I received the usual several check offer to use two for purchases and the others, etc……..Fortunately, I did not write aCHASE check for my purchase today or it would have bounced and I could have possibly been fired for giving them a bad check, which I have never done in my Junior and now senior years. It is policy of my company to terminate or address a employee if same is done. I understand the changes being made by the credit card companies but it was also my understanding they had to notify you prior to or letting you know they were going to cancel your cards. Being a CHASE CARD(s) HOLDER for many years and have taken advantage of their offers previously and never defaulted, I cannot believe that this company has lowered itself to these standards. They have just merged and are offering many options to new customers. It was my intention to change from Bank Of America, whom I have never encountered a problem (YET) and go with CHASE based on the exceptional offers and treatment I have always received over many years. Obviously, this thought has been deleted from my head. I had planned on doing a search for their executive office but from what I am hearing, reading and obviously experiencing, I would only add my name and complaint to the thousands that have already done so. Therefore, I thank you for letting me vent and hopefully others will pull out of CHASE and support the smaller financial struggling institutions. P.S. – I was able to get my HDTV by using another credit card from a company that hasn’t lowered themselves as of this date.